The Earth��s magnetopause is the result of the interaction between the supersonic solar wind and the Earth��s magnetic field. It basically separates the interplanetary magnetic field from the Earth��s magnetic field and prevents most solar wind plasma from entering the Earth��s magnetosphere. It adjoins the low-latitude boundary layer, the entry layer, the cusp and the plasma mantle [Eastman et al., 2000; Phan et al., 1997]. It is also the place where the reconnection occurs with the mass, energy and momentum transfer from the magnetosheath into the magnetosphere. 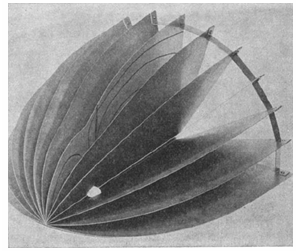 Figure 1锛�The Earth Magnetosphere. This figure is from "ENA measurements of the ring current" report. 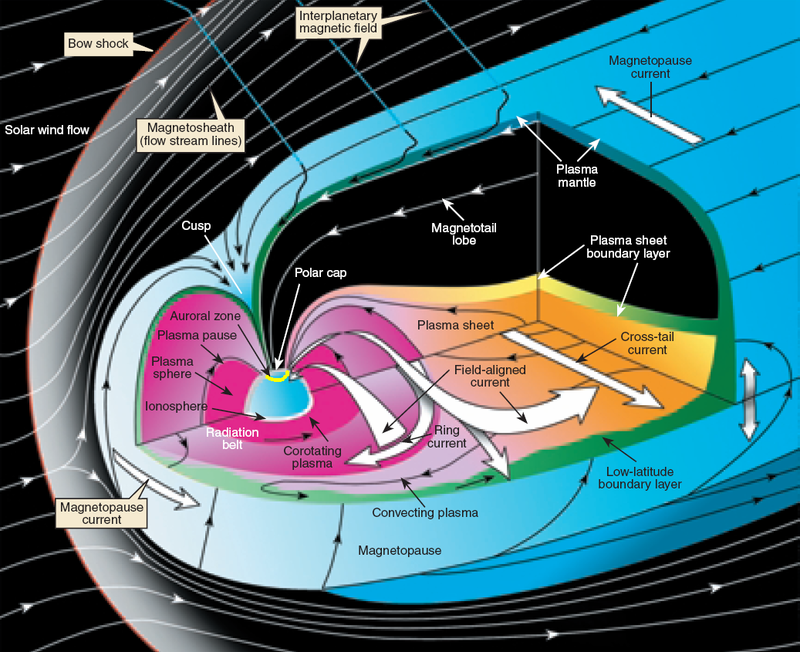 Previous theoretical and statistical studies indicate that the global structure of the magnetopause is greatly influenced by the solar wind plasma and the interplanetary magnetic field. Under varying solar wind conditions, the magnetopause subsolar distance, r0, can be changed from 5.2 Re to 14 Re [Kuznetsov and Suvorova, 1998]. When r0 is less than 6.6 Re, geosynchronous satellites may cross the magnetopause and experience anomalies such as attitude and angular momentum control distortion [Shue et al., 2001]. Therefore, the prediction of the magnetopause size and shape is important not only for theoretical research and numerical simulation, but also for space weather applications. �������� Figure 2锛�The dynamic magnetopause is controlled by solar wind. The left panels show the solar wind parameters, and right panel shows the magnetopause, blue curve, from Lin et al. and the bow shock, red curve,from Chao et al. Various empirical magnetopause models have been developed in the past decades [Fairfield, 1971; Howe et al., 1972; Holzer and Slavin, 1978; Formisano et al., 1979; Petrinec et al., 1991; Sibeck et al., 1991; Roelof and Sibeck, 1993; Petrinec and Russell, 1993, 1996; Kuznetsov and Suvorova, 1996; Shue et al., 1997, 1998; Kuznetsov and Suvorova, 1998; Kawano et al., 1999; Boardsen et al., 2000; Kalegaev and Lyutov, 2000; Chao et al., 2002]. Most of them were developed mainly based on low-latitude magnetopause crossings with the rotationally symmetric assumption and parameterized by the solar wind dynamic pressure (Pd) and/or the interplanetary magnetic field (IMF) Bz. These rotationally symmetric models often use an elliptic function, a parabolic function or the Shue model function as a basic functional form to describe the magnetopause. In order to overcome the limit of an elliptic function, which must cross at some point on the nightside and can��t represent the distant tail magnetopause [Slavin et al., 1985], Petrinec and Russell  used the inverse trigonometric functions to describe the nightside magnetopause and Kawano et al. used a cylinder to represent the tail magnetopause from the position where its transverse radius () reaches the maximum. The Shue model function has the flexibility to produce an open or closed magnetopause and has a reasonable extrapolation ability to predict the distant tail magnetopause. In addition, the saturation influence of southward IMF BZ on is also considered in the Shue et al. model and the Kuznetsov and Suvorova  model. It is noted that the Petrinec and Russell  model, the Shue et al. model and the Chao et al. model have an appropriate capability to forecast geosynchronous satellites crossing the magnetopause under extreme solar wind conditions [Yang et al., 2002]. Lin, R. L., et al (2010), A three-dimensional asymmetric magnetopause model, J. Geophys. Res., 115, A04207, doi:10.1029/2009JA014235.